Posted on Thu, Apr 5, 2012 : 4:39 p.m.
Former Michigan women's basketball coach Kevin Borseth was introduced as the new coach at Wisconsin-Green Bay on Thursday. Borseth was head coach of the Phoenix from 1998 to 2007. Kevin Borseth's bank account will be smaller. His happiness level, however, has grown exponentially. 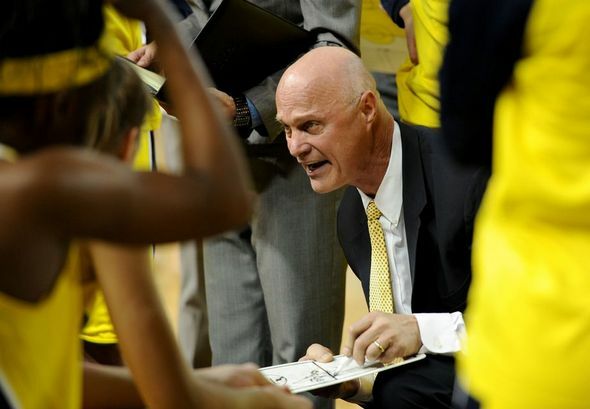 The former Michigan women's basketball coach's family convinced him to make the move back to Wisconsin-Green Bay, the place he coached from 1998-2007. Not long after he informed his Michigan players of that decision and word started circulating around Ann Arbor and Green Bay, Borseth said his phone was instantly filled with text messages. At least 200 of them, he said, include the words "Welcome home." Borseth had only kind words for Michigan, but said the job may have been too consuming. "That walk of life didn’t fit me very well," Borseth said of the Michigan program that he led to the NCAA Tournament for the first time since 2001. "As a result, it evidently showed in my happiness, because that’s what my wife (Connie) said. She said 'You’re not happy.' One of my daughters said, ‘That’s what I pray for. For you to be happy.’ That was an eye-opening statement for me." Borseth resigned Wednesday after five years at Michigan. In those five seasons, the Wolverines compiled an 87-73 record and two of the four 20-win seasons in program history. Michigan won a total of 21 games in the three seasons prior to Borseth’s arrival. "I left (Green Bay) five years ago to pursue a dream, to coach in the Big Ten," Borseth said in a press conference streamed live on the Wisconsin-Green Bay website. "But when you’re separated from your support group -- my parents, Connie’s parents, brothers and sisters, aunts and uncles, friends -- to leave those people to go somewhere else, it’s difficult. At what point should a 50-some-year-old guy cut mom’s apron strings and head out someplace? I should be able to do that by now, but I wasn’t very good at it." Borseth is a native of Bessemer, Mich., which is about a 4-hour drive from Green Bay, compared to the 10-hour trek from Ann Arbor. His children -- sons KC and Kale and daughters Carli, Kayla, and Kaitlyn -- were born in Green Bay. Borseth will likely take a significant pay cut in the move. UWGB athletics director Ken Bothof joked while introducing Borseth that the school's athletic budget has increased while he was gone, but that it still didn't rival that of Michigan. Borseth made a base salary of $193,000 at Michigan, but his total compensation was approximately $300,000. According to the Green Bay Press-Gazette, Borseth made a base salary of $116,092 in his final seasons at UWGB. Matt Bollant, who left Green Bay for Illinois, made approximately $150,000 last season. Besides the "peace of mind," happiness and proximity to family, Borseth will also take over a solid program. In 2012-13, Green Bay will return four starters from a 31-2 team that won Horizon League regular season and tournament titles and advanced to the second round of the NCAA Tournament. Borseth started a string of 14 straight conference titles that continued under Bollant. The Phoenix won a school-record 29 games in Borseth’s final season. They topped that under Bollant twice, winning 34 games in 2010-11 and 31 last season. UWGB also averaged nearly 1,000 more fans per home game than Michigan last season, according to NCAA statistics. The Phoenix averaged crowds of 2,712, which is the 43rd-best total in the nation. Michigan averaged 1,773. Fri, Apr 6, 2012 : 8:27 a.m.
Look on the bright side, he left behind a legendary angry press conference which will be replayed for many, many years to come. Fri, Apr 6, 2012 : 4:24 a.m. Wonderful family. Outstanding that his family is so supportive. Says a lot about him and his family. Good luck to you all. We hope you truly do find the happiness your looking for. Thanks for boosting Michigan Women's Basketball program too. Fri, Apr 6, 2012 : 12:11 a.m.
You can't argue with going home. You also can't argue with doing the job that truly makes you (and your family) happy. Good luck to him! Thu, Apr 5, 2012 : 11:47 p.m.
You can't say he up and bailed on us, like that PIttsburgh football coach did when he moved after one year to Arizona State University. Borseth was an effective if not unspectacular coach. He brought Michigan women's basketball to a higher level than it had been under Sue Guevara, and he pretty much didn't embarrass himself and definitely not the university. He is going home. Nothing wrong with that. He is leaving on his own terms, for his own happiness, after giving us a full 5 years. Admirable guy to follow his heart yet still give his time to his school. Change is tough, but 5 years is a full student complement, so it's fair. Thu, Apr 5, 2012 : 11:25 p.m.
Good luck Coach and thank you for your contribution to Michigan women's basketball over the last 5 years. I think we're moving up as a result. Thu, Apr 5, 2012 : 10:18 p.m.
Thu, Apr 5, 2012 : 9:02 p.m. I met him at a banquet before the women's game that he errupted during the post-game press conference and I've seen him around a few times since. He's a solid character. Best of luck in Sconny Borseth!